Right now, my daughter B is visiting from Canada. Because Texas is warm and Canada is not. She likes Yoga, ballet, and cooking. She also likes books and has a great book review blog. Notice her whimsical side. All that aside. Texans living in Canada can be pretty certain that the Canadian take on Tex Mex is going to disappoint. So, outliers and non-Texans (those who live North of the Nueces (pron. “new-aces”) River, I’m going to pass my super secret recipes on to you. I spent 28 years South of the Nueces River and, let me tell ya’, this gal knows how to make Tex Mex. I learned from folks who own restaurants, from firemen born and raised in South Texas, and from folks who’ve been cooking this way their whole life. First things first. Don’t even dream of buying a can of enchilada sauce. I see this in recipes all the time. I’m going to teach you how to make really great enchilada sauce. In a saucepan on the stove, heat your broth and add all of the spices. Once it is heated, slowly mix some of the broth with the corn starch until it forms a paste. Add the paste to the broth on the stove. Cook until the corn starch thickens the sauce. Let cool. You will need to soften your corn tortillas in order to stuff and roll them. I do this by putting them 4 at a time on a plate in the microwave and then covering them with another plate. I nuke them for 40-45 seconds. My daughter prefers to dip hers in the hot enchilada sauce. Either of these methods works well. Take 1 corn tortilla, fill it with cheese and roll it up quickly. Turn it rolled side down and put it at one end of a 9 x 13 pan. Continue in the same manner until your pan is filled with enchiladas. I do mine 8 across and then 4 side by side (see placement in the above picture). Put the enchiladas uncovered into the hot oven for 8-10 minutes. Just enough for the the tortillas to dry slightly. Pull the pan out of the oven and evenly pour the enchilada sauce over the enchiladas. Top with lots and lots of cheese. If you want onions, add them before you add the cheese. Cover with foil and bake at 350 degrees for 30 minutes. You will know they are perfectly done when you hear that sizzling, bubbling sound. If you overcook them, they will be mushy; if you undercook them, they will be chewy. Listen for that bubbly, sizzling sound. I don’t always want cheese enchiladas, so sometimes I change ’em up a bit. I fill them with beans and cheese, or chicken and cheese, etc. Below are a few options. OPTIONAL STEP: When making enchiladas, adding in some of the optional ingredients will alter the amount of cheese you add to your enchilada. With any of the optional ingredients, add 1-2 T. of your desired ingredient AND 1 T. grated cheese. 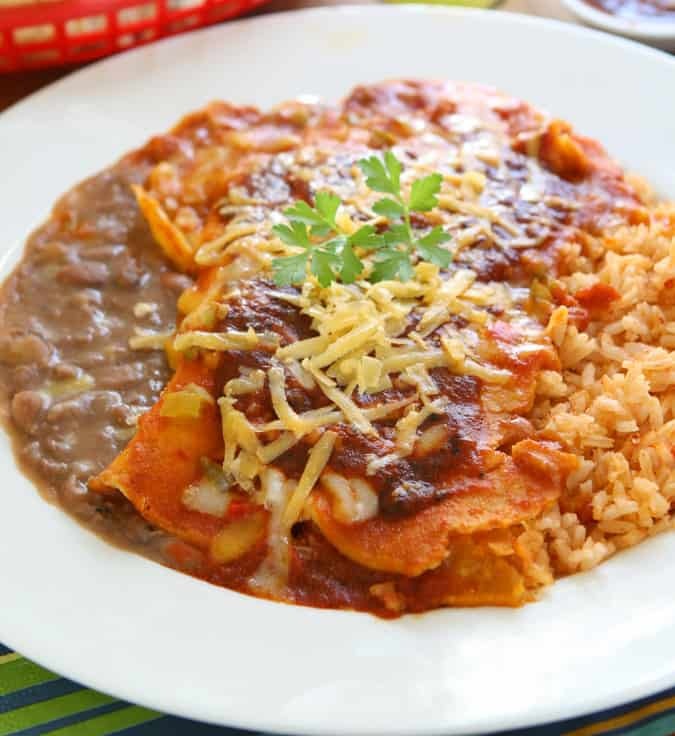 Any true Tex Mex restaurant will have an entree on its menu an item that will contain two enchiladas, beans, and rice. The rice is Spanish rice and sometimes the beans are just beans and other times they are refried beans. I learned how to make real Spanish rice from my neighbor, Olga, who is from Alice, Texas. You don’t get more South Texas than Alice, Texas. In a skillet, heat 1 T. oil and add rice. Cook until the rice is translucent then add the onions, bell pepper, and garlic. Add the broth and spices. Cover the pan and reduce the heat; cook for 20 minutes over a low heat. I've tried making Spanish Rice with brown rice and it never turns out. White rice is really the key to perfect Spanish Rice. Once beans have been sorted, rinsed, and soaked; drain away the water. Add them back into the pot and cover them with beef broth. Add the onions, jalapenos, garlic and spices. Cover the pot, reduce the heat to low and simmer until soft. Another option is to use a crock pot. Set the heat on high (skim any foam off the top) and cook until soft. If you use a crock pot and cook it on low, you will need 6-8 hours of cooking time. Once these beans are cooked you can easily turn them into Refried Beans. Since they already have a Tex Mex flavor, the rest is simple. Remove 2 cups of beans from the pot and drain off the liquid. Mash the beans up with a food processor or a fork. Heat a skillet with oil (bacon grease is best, but other oils work). Add the mashed beans to the hot oil and cook until they start to stick to the bottom of the pan. Stir with a wooden spoon (Olga absolutely insisted I used a wooden spoon) to keep them from sticking. You may have noticed that these recipes have several ingredients in common. Chili powder, cumin powder, and garlic powder. I use so much of this that I buy the gi-nor-mous containers at Costco. Way, way cheaper than the little bottles at the super market. These recipes also call for beef broth. This is really key here to getting an authentic flavor. On all of my recipes I have purposely omitted salt because the beef broth usually has enough salt. I usually make my own broth so be sure to add in salt if that is the case. So, chime in if you decide to make bona fine, genuine, authentic Tex Mex. Oh my goodness this sounds so delicious! Thanks, I need some education on these matters… Have not even had any enchiladas. Ever. And I love your daughter’s blog too, will definitely check in over there for ideas on what to read next! I am a Texas girl displaced in Missouri. Let me tell you, they don’t know Tex-Mex here either! It is such a disappointment when we try a new Mexican restaurant. So, I cook the good stuff myself. I am always happy to try to recipes to please my Tex-Mex loving hubby. 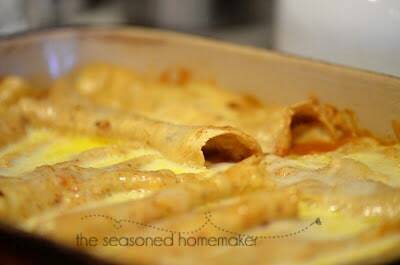 Your enchiladas will definitely please this household!! Thanks for sharing your recipe and linking to Tempt My Tummy Tuesday! I hate canned enchilada sauce so I’m totally intrigued by your recipe … I have to try it! I am definitely guilty of using (and recommending) canned enchilada sauce. Next time I will make your version and point others here too. 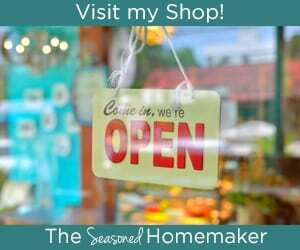 Thanks for the recipe and for linking up at Saturday Dishes! Another convert to homemade enchilada sauce! One day, I will conquer the canned enchilada sauce world! The enchilada sauce sounds good and the pictures look great. Enchiladas are my favorite Mexican dish. In New Mexico and Colorado we make it a little differently though I take a dozen dried red chiles (like you would find on a ristra), take the stem off and empty some of the seeds out if your chiles are hot, place them in a blender full of hot water and soak until they are soft and pliable. Keeping the chiles in the blender jar, empty the water out and fill it 2/3 of the way full of more hot water, 2 large peeled garlic cloves, 2 tsps. kosher salt and a teaspoon of oregano. Blend it for a long, long time, until it’s really smooth. Make a roux with 1/4 each shortening and flour, cooked until it’s a slightly browned, then pour the chile mixture into the blender and whisk. Add a half blender full of water to the chile. Simmer for 20-30 minutes and assemble your enchiladas. Can use for tamales also. If you would like to try this method, I bet you will love it! I’m going to try yours as well. Thanks for the recipe. It sounds amazing. I’m such a Tex-Mex fan (had it for dinner tonight) but this sounds amazing. I made all of this for dinner on Monday. My husband loved it so much he asked if we could have it again for Easter dinner! The only thing I changed was added more liquid to the enchilada sauce to make more and it was still awesome! Thank you for the recipes!!! Can you freeze this meal and bake? Thank you! Yep, I do it all the time.